KIEV, Ukraine -- A senior adviser to Russian President Vladimir Putin has lashed out at Ukraine's president ahead of the signing of a controversial EU deal. 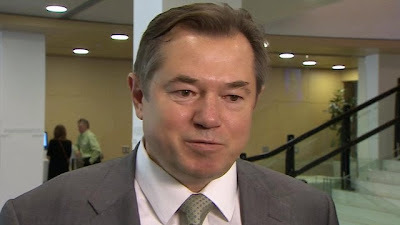 Adviser to Vladimir Putin Sergei Glazyev says Ukrainian President Petro Poroshenko is a Nazi. Sergei Glazyev said Petro Poroshenko was a "Nazi" and his endorsement of the deal was "illegitimate". Mr Poroshenko is expected to sign the full association agreement at the EU summit in Brussels later today. A shaky ceasefire in eastern Ukraine, where pro-Russian rebels are fighting government forces, is also due to end. The pact - which would bind Ukraine more closely to the West both economically and politically - is at the heart of the crisis in the country and is strongly opposed by Russia. Mr Poroshenko's predecessor Viktor Yanukovych refused to sign the deal and protests led to his overthrow. After this, Russia annexed Ukraine's Crimea region and pro-Russia separatists in eastern regions declared independence, claiming that extremists had taken power in Kiev. In another development early on Friday, rebels released four international observers captured more than a month ago. "We don't expect anything in return - we freed them without any pre-conditions," he said. The OSCE said it remains concerned about four other observers captured at about the same time. Political parts of the association agreement, aimed at forging closer ties with the EU, were signed by Ukraine's interim government in March. Mr Poroshenko previously announced he would sign the crucial trade and economic relations portion of the pact on Friday, along with Georgia and Moldova. And on his arrival in Brussels, he hailed "a historic day, the most important day since independence" in 1991 which offered his country "an absolutely new perspective". "Europe is trying to push Ukraine to sign this agreement by force. They organised [a] military coup in Ukraine, they helped Nazis to come to power. This Nazi government is bombing the largest region in Ukraine." Asked if he believed Mr Poroshenko was a Nazi he replied: "Of course." Sergei Glazyev is not an official presidential spokesman but it's still an astonishing outburst from a man who is a senior presidential adviser, and it reflects the general feeling of irritation or anger in Moscow that Ukraine, Moldova and Georgia are signing historic free trade deals today with the EU. Moscow has economic concerns here. Russia fears that once the free trade deals are signed then European companies could use Ukraine, Georgia and Moldova to flood Russia with cheaper goods, hitting Russian manufacturers. "I think after the signing of the agreement with EU, [the] European public will be... surprised when this Nazi Frankenstein, which was born by the Euro bureaucrats and some politicians, will knock on the European countries' doors," he said. He said Mr Poroshenko was an "illegitimate" president because parts of Ukraine did not vote in May's elections. His claims come despite President Putin engaging with the Ukrainian leader on peace negotiations. He also said that Mr Poroshenko had no constitutional right to sign the treaty, which would damage the Ukrainian economy. Free trade with the EU would come at the expense of free trade with Russia, he added, and Ukrainian goods did not conform to European technical standards. Fighting is said to have continued in some areas of eastern Ukraine despite a temporary ceasefire this week. Talks on extending the truce in in the Donetsk and Luhansk regions are also set to take place on Friday. Russia denies it has allowed militants and heavy weaponry to cross its border into eastern Ukraine. The US and EU are threatening to impose further sanctions if Russia does not act to defuse the situation.